Bummed out by the prospect of a full weekend of rain, I thought I'd share a little pop of color. 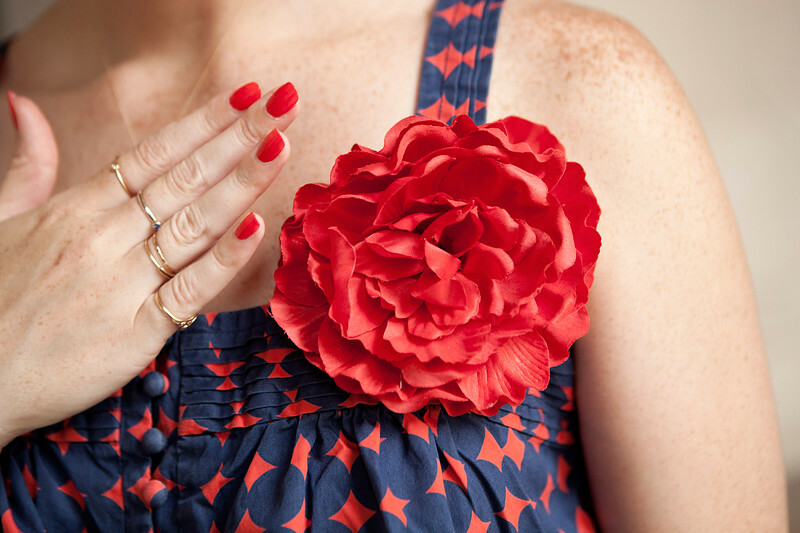 The flower is from Kate Spade, the shirt is very old J.Crew and the nails are Essie Geranium and Essie Short Shorts. Kate Spade's entire fall ad campaign is around the idea that "Understated is overrated." 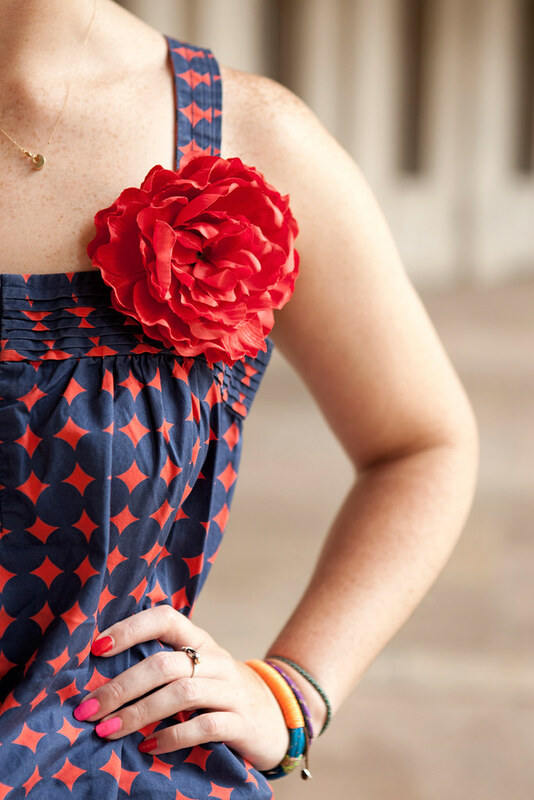 Take a look at some of the more bold uses of the flower here. The abrupt arrival of fall weather caught me a bit off guard last week. I'm not complaining per se because I really do love layering, but I'm also not ready to give up open toes, bare legs and breezy dresses just yet. 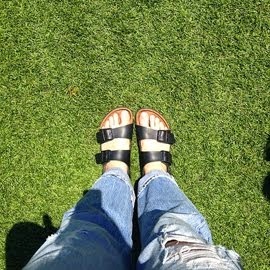 Luckily, I can hold on to at least one of those for a bit longer with my new Alexander Wang Suvi Ankle-Cuff Sandals. I wore them casually this weekend with a cozy sweater from J.Crew and Zara camo cargos and dressed them up for the premiere of "God Save My Shoes" with The Outnet during NYFW. 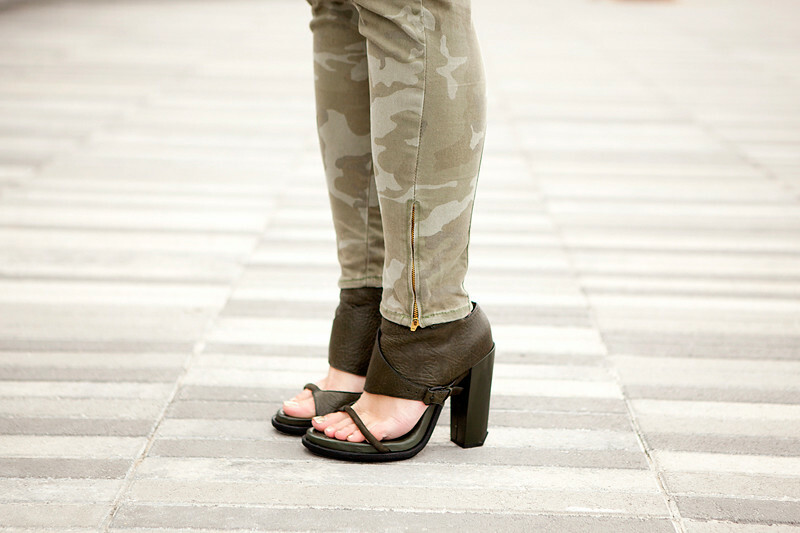 The heft of the heel and bold leather upper make these the perfect transitional piece; tough enough for fall, while still showing off my pedicure. Watch the trailer for "God Save My Shoes" for a peek at the lives of some of the funniest shoe-obsessed women. Miu Miu officially takes the cake as the brand most imitated on my nails. This is my fourth iteration of Miu Miu nails, but take a look at 1, 2 and 3 to see how just far these posts have come. 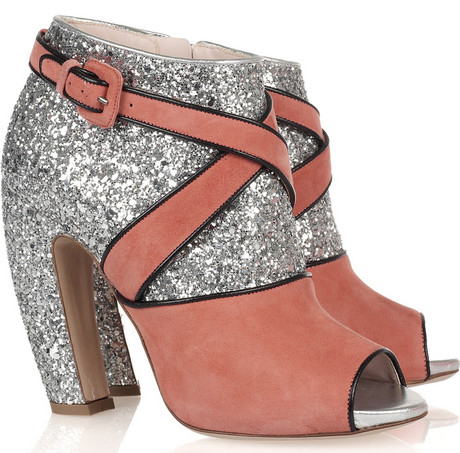 This time around I decided to take on the shoe of the moment, Miu Miu's glitter booties. 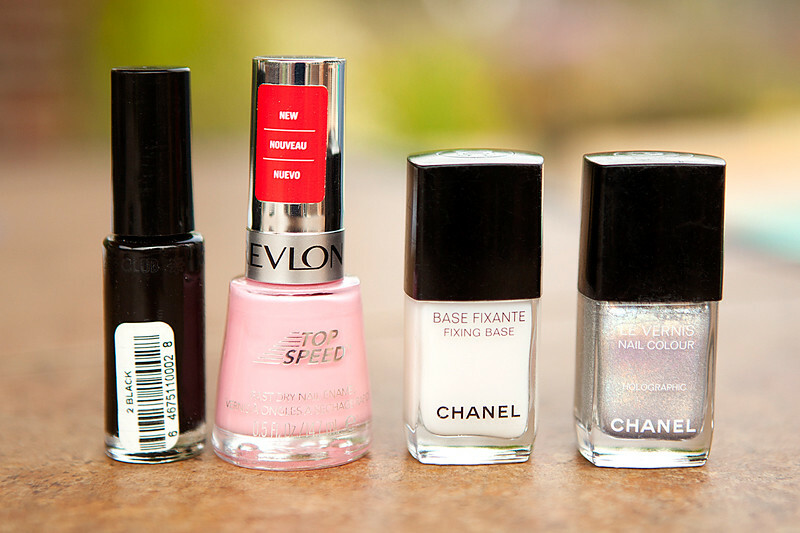 For the glitter base I used Chanel's "Holographic" which is probably my only nail polish with a story. It was only available for sale in Europe and I bought it with a voucher from a very upsetting canceled flight from Venice to Copenhagen while I was studying abroad. I used a the nail polish brush to paint a pink tip and a fine paint brush to paint a thinner "X" for the ankle strap. After an even finer black outline and a shiny topcoat, I was done. All photos by Mark Iantosca. View even more here. 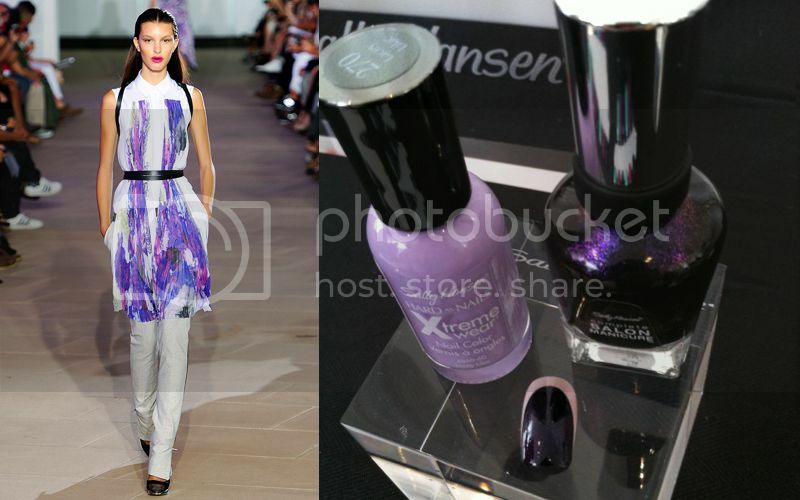 It isn't all that often that I am inspired by the nail art of fashion shows. I prefer to take my own inspiration from what walks down the runway. I expect this season will be a bit different since nail art has hit the mainstream. The first example of backstage beauty done right is from Pamela Love's jewelry presentation. 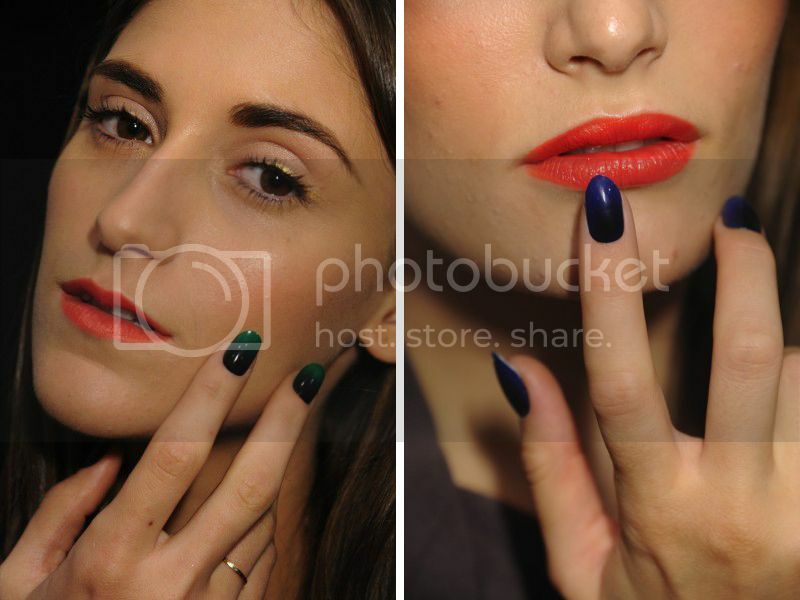 I like how she and Essie's stylists translated her signature pretty toughness onto the nails. The black diamond moon manicure is the first square nail I've seen in a long time that doesn't make me cringe. It also takes some of the more geometric elements of the Moroccan influence and makes them thoroughly modern. 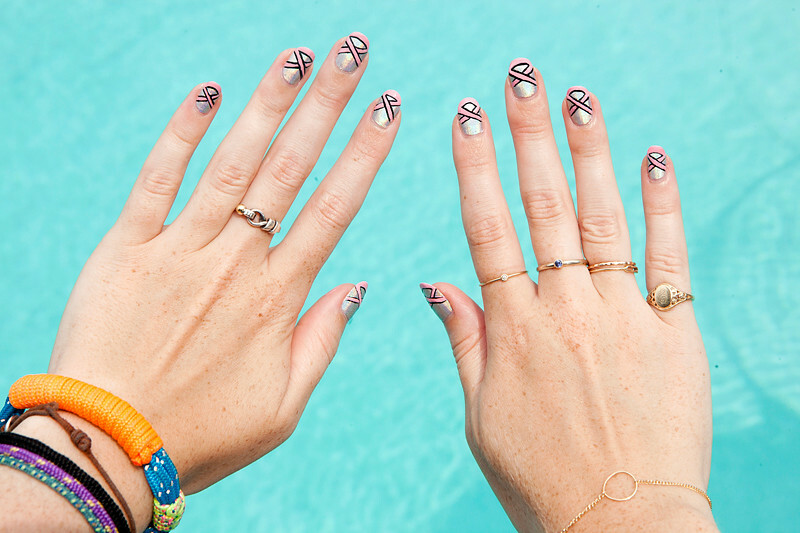 The gold nail captures more of the thrill of the wilderness, like the glint of the setting sun. A solid gold nail is a favorite of mine for this fall as well, so expect to see more of that to come. In honor of Zara's US online shop launching today, I have picked out my favorite item available now. The sad, sad irony is that Zara's shoes rarely fit me. They are often too small and I'm *only* a 40. If these metallic wonders did fit me, I wouldn't want to take them off. 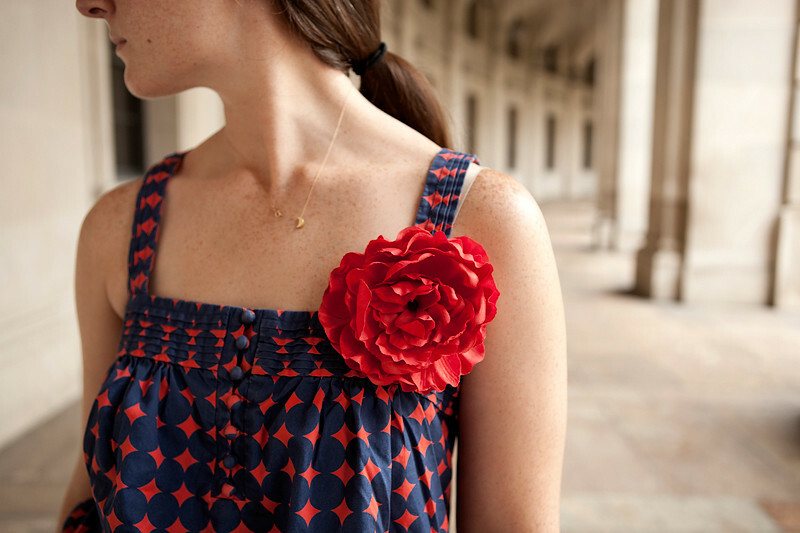 And in that uniquely Zara way, they draw inspiration from so many places, it actually makes them unique. How's that for originality? 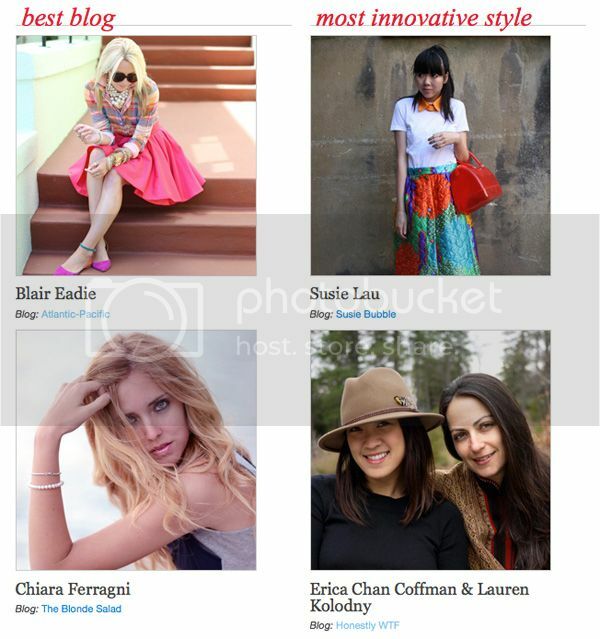 I was a little slow to mention this, but somehow I was nominated by Lucky Magazine for "Most Innovative Style." The awards will be announced tomorrow at their FABB Conference and I really am flattered to just be included with such a great group of bloggers. Also in the category are Susie Bubble, Honestly WTF, Bleach Black, and Guerreisms. I think it's great for Lucky to celebrate the wide range of voices present in the blogging community, many of whom inspire me. Congratulations to everyone involved and see you tomorrow!